The 2011 Northbound migration was a late one. We didn’t stop our Monroe Wagner on site observations until 6/22, at which point we were down to only 32 swifts. We had been getting the counts for 66 days straight and were more than ready to call it a migration. Because our security camera inside the chimney continued to live stream I decided to see if there was any swift action in the Monroe Wagner chimney during the summer. I suspected there might be, but we had never taken a close look before. There is not indication that there have ever been nests in this chimney, but not every swift finds a mate and builds a nest. Might these non-breeders continue to use the Wagner roost site until it was time to head south? 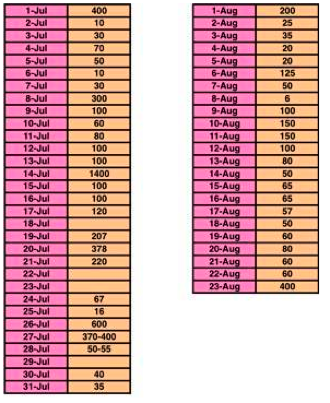 From 6/24 to 8/23 we were able to determine if there were swifts using the chimney on 55 of the 60 days. Every day we were able to check for swifts we found them. The low count was 6 on 8/8, and the high count was a surprising 1400 on a rainy 7/14. Were these late migrants? There had been 100 each of the two previous rainy days. The summer averaged 147 swifts roosting per night. The Vaux’s Happening project was lucky to get Carl McCall involved with the Church Lofts roost site in San Diego. Carl has continued to make observations into the 2011-2012 winter and has discovered, and video documented, a flock of 50 Vaux’s Swifts are using the roost site on an apparently nightly basis. Carl’s last observation was 2/20/12 and this was written 3/5/12.